Monday, September 14, 2015 at 12:30 pm – 2:00 pm – Click here. Wednesday, September 16, 2015 at 12:30 pm – 2:00 pm – Click here. Monday, September 21, 2015 at 12:30 pm – 2:00 pm – Click here. Wednesday, September 30, 2015 at 12:30 pm – 2:00 pm – Click here. A second edition of “Flatland,” published in 1884. 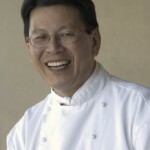 A multifaceted, multidimensional, multimedia book blog for you today. This is the ninth in a series of blog posts that celebrate the “Book Blogs” created by students in Professor Siân Echard’s “The History of the Book” course during the spring 2015 term. For this assignment, students in the class were asked to choose an item (book or otherwise) from RBSC, research its history, and introduce it to a public audience through a blog or wiki. 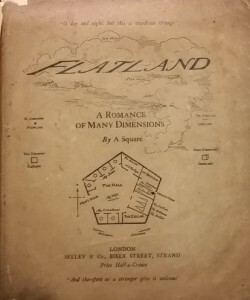 Caprice Pybus discovered a second edition of Edwin A. Abbott’s novel Flatland: A Romance of Many Dimensions in Rare Books and Special Collections, and began to explore the ways it has been appropriated by artists, students, and publishers, leading to the creation of a journal, a twitter handle, and a fascinating blog. The Library’s Interlibrary Loan (ILL) and Document Delivery Service (DocDel) services will be unavailable for two hours on Thursday, August 27, between 4 p.m. and 6 p.m. for system maintenance. The service is being migrated to a new server. Once the service is reactivated, there should be no difference in usage. If you are using the application and experiencing technical issues, please contact Gary Liu in Library IT Services (604 822 6778) between the hours of 9:30 a.m. and 4:30 p.m. Thank you for your patience as we improve the reliability of this system. Update: As of Thursday, August 27 at 6 p.m. all services have resumed. Thank you. 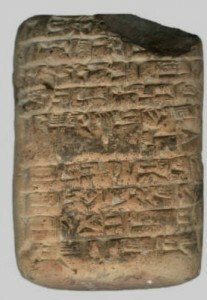 Ready for part 2 of our postings on the cuneiform tablets in the Ancient Artefacts Collection? In the previous post we learned a little about the cuneiform tablets and provenance in general – with a cliff hanger of course. What IS the provenance of Rare Books & Special Collections cuneiform tablets? This post we will come closer to finding out. Lisa Cooper, Associate Professor of Near Eastern Art & Archaeology in UBC’s Department of Classical, Near Eastern, and Religious Studies Department, was able to help us start to unravel the mystery. 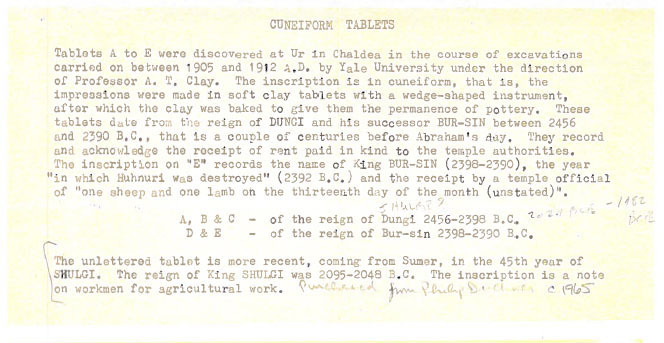 Arriving at UBC at some time in the early 20th century CE the tablets were accompanied by a typed note intended to provide information about their provenance. However the note was full of, at best, misinformation and at worst? Lies. Looks official doesn’t it? Much of the information here is untrue! The note endowed the tablets with significant cachet – including stating that the tablets had originated in the famed city of Ur (mentioned in the Bible, among other things). 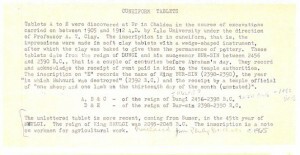 It also states that the tablets been excavated through a University dig between 1905 and 1912 by Yale University under the direction of Professor A.T. Clay. Sounds pretty important doesn’t it? Too bad not one part of it is true. Another note full of misinformation accompanying the tablets. We know today the first excavation of Ur wasn’t until 1922 – by the British Museum and the University of Pennsylvania. The professor in question, A.T. Clay, didn’t even visit Mesopotamia until 1920, about 10 years after the dates indicated in the notes. So where did these tablets come from? How were they found? Who brought them to UBC? Where did this guy come from? Who found him? Will we ever know for sure? We still don’t know all the answers to these questions, but we are starting to learn more. Unprovenaced items like the RBSC tablets can end up being the subject of much discussion. The debate centers around the morality and legality of the acquisition of these items by western institutions. For more information on that debate, check out Professor Lisa Cooper’s UBC news piece on antiquities from the Middle East. The little we can conjecture about the RBSC tablets is that they were likely purchased in an antiquities market in the early 20th century. Someone may have translated the tablets, seen the Third dynasty of Ur marking the era, and mistakenly believed the tablets were from Ur. The mistranslation could have been because the tablets were originally translated 50-60 years ago – before we have the knowledge of the past we do now. Put that misinformation together with someone looking to make a profit, or even just guessing at a possible provenace, and volia! You have items originating out of thin air. Due to contextual information in the tablet writing, we now believe that three tablets originate from the Umma region and two come from Puzrish-Dagan region. As well, recent scholarship dates the reigns of Shulgi and Amar-Sin – the two kings mentioned in the tablets – to almost 300 years earlier than originally thought. Tomorrow, who knows? With the provenance of many ancient items, including ones such as these, there is always more to uncover. Christa Roodt, Private International Law, Art and Cultural Heritage (Cheltenham: Edward Elgar Publishing, 2015). Nancy E. Johnson, ed., Impassioned Jurisprudence: Law, Literature, and Emotion, 1760-1848 (Lanham: Bucknell University Press, 2015). Sharryn J. Aiken, Catherine Dauvergne, Donald Galloway, & Colin Grey, Audrey Macklin, Immigration and Refugee Law: Cases, Materials, and Commentary, 2d ed. (Toronto: Emond, 2015). American Law Institute, Restatement of the Law, Employment Law: As Adopted and Promulgated by the American Law Institute at Washington D.C., May 21, 2014 (St. Paul: American Law Institute Publishers, 2015). Rutsel Silvestre J. Martha, The Financial Obligation in International Law (Oxford: Oxford University Press, 2015).